The beautiful and majestic bald eagle is one of the largest known raptors. Have you ever wondered how the bald eagle came by that name? The white plumage on its head makes it appear bald, thus its name. This beautiful and majestic bird is one of the largest known raptors and well known as it is the national bird and symbol of the United States. This eagle is found in not only United States, but Canada and northern Mexico as well. The male bald eagle is typically smaller than their female counterparts. Both have impressive wing spans of anywhere from 6 to 8 feet. Bald eagles boast flight speeds from 35 to 44 mph, making them a formidable predator in the wild. They can reach heights of 32 to 40 inches tall and weigh in around 7 to15 pounds. When eaglets are first born, their feathers are light gray in color. At the time they leave the nest around twelve weeks of age, their feathers have turned to a dark brown. 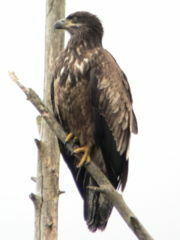 Mottled brown and white feathers make their debut between the time the eagle is three and four years old. By the time they are four or five years of age, they have earned the white plumage on their head that is so distinctive. Both males and females have a yellow, hooked beak and yellow irises in their eyes. Eagles gravitate toward large bodies of open water that will provide a consistent food supply, so their habitats include forests, valleys, seacoasts, mountain regions, lakes and rivers. 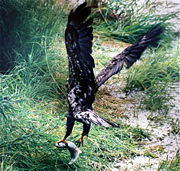 Fish, ducks, rodents, carrion, snakes and other small mammals are a eagles primary prey. They've been known to eat medium-size mammals as well and always hunt during the day. They use their talons to catch the prey and use their beaks to tear the flesh into pieces they can manage. 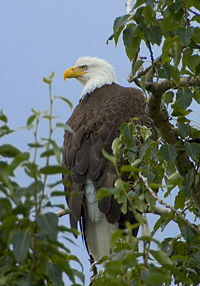 Well-established coniferous or hardwood trees are a favorite of eagles for nesting. Once a nest is built in the limbs of a tall tree, it will be used for years. Each nesting season, new sticks and mosses will be added to make it inhabitable for the new eaglets. Bald eagles mate for life and are serious nest builders. A typical nest is 2 feet high, 5 feet across, and weighs nearly 4,000 pounds! In the spring, the female lays two eggs. One or two chicks will hatch after 35 days or so. Usually, only the most aggressive one will survive and will leave the nest at about 15 weeks old. An eagle is able to survive nearly 40 years in the wild and can live even longer in captivity. For several years, the bald eagle was considered an endangered bird due to their habitats being taken over by development projects in coastal areas, poisoning, and hunters shooting them to obtain their feathers. 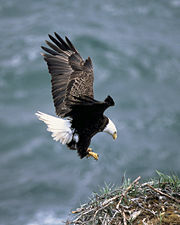 However, in June 2007, the American bald eagle was removed from the Endangered Species list by the Interior Department. This beautiful bird remains protected by the Eagle Protection Act. This piece of legislation "prohibits the take, transport, sale, barter, trade, import, and export, and possession of eagles", which means no one is allowed, under penalty of the law, to obtain eagles, parts of eagles, their eggs or nests without a legal permit (such as educational facilities like a zoo). Native Americans see the eagle as a sacred bird. The feathers of the bald eagle are used in many of their ceremonies and are an important part of their ancient customs.